Rep. Michael Grimm (R., Staten Island) apparently wanted to unwind after the State of the Union with a little good-old-fashioned Reporter tossing from the Capitol Rotunda. 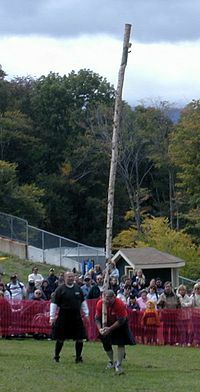 A traditional form of exercise, RT (as it is called) is highly aerobic and involves throwing an adult reporter from a stationary position with no more than three paces before the launch. This is much more difficult than tossing the caber in Scottish game because the journalists tend to be odd sized and flexible. They are the second least aerodynamic of profession (after Sumo wrestlers). There is also the problem of congressional ethics rules and criminal assault concerns. However, if Grimm looked in ill-humor, it was nothing like the mood of voters. Grimm had given an interview to NY1 political reporter Michael Scotto where he called the President’s speech “divisive.” Scotto however was going to end the interview with a question about an ongoing federal investigation into his 2010 campaign fundraising. The Justice Department has charged 47-year-old Diana Durand with using straw donors to exceed the maximum allowable contribution to Grimm’s campaign committee. Frankly it is not a huge amount and I am not sure why Grimm could not handle the question. She allegedly offered to reimburse four friends if they contributed to the campaign because she has maxed out on individual contributions. Grimm released a statement following the incident. House.” Threatening to throw reporters from great heights is probably not in accordance with the spirit of that rule. On the speech itself, I watched it with my kids. I do not think much of State of the Union addresses which are increasingly well-orchestrated photo ops with little true content. As in the past, I was most struck by how out of touch all of these politicians seems, including the President. Democrats had almost Stepford Wife faces of glee and adoration at the President. Republicans carefully managed their applauding so not to appear too supportive or too oppositional. However, that chamber left the appearance of hundreds of people secure in some highly ornate political bunker — entirely unconnected to the anger and disgust of most voters. The day of the speech, the result of a new major poll showed that over half of Americans disapprove of the president’s job performance. Likewise, nearly six in 10 say they are uncertain, worried or pessimistic about what he will do with the remainder of his presidency. Congress showed the same dismal approval rates. Yet, there they were. Smiling and ecstatic in a communal celebration of the monopoly power exercised by their two parties on this country. It was truly otherworldly. Don’t quote me please but…. has anyone noticed that while NY-1’s Michael Scotto seems like a nice young man his Uncle is Anthony Scotto, feared Gambino boss and the King of the NY waterfront for many years. Great link Swarthmore mom! It is looking pretty grim for our angry congressman. http://talkingpointsmemo.com/edblog/grimm-and-grimmer-for-grimm Grimm unknowingly messed with the Gambino family. The reference to your not man enough remark from Grimm was to the reporter a hate remark, because the reporter is openly gay….Of course the MSM will not report on that …………. Michael Grimm’s bullying sickness: Who’s the real “thug” here? Because he verbally, not physically, roughed up San Francisco 49er Michael Crabtree after the NFC championship game 10 days ago, Sherman was globally denounced as a “thug” and worse, as ugly racial stereotypes and flat-out projection defined the talented scholar from tough Compton by way of Stanford University as a criminal. Stand Grimm and Sherman side by side, there is only one “thug,” and it’s the GOP congressman. Apart from charges of campaign finance and business wrongdoing, Grimm has been criticized for overall boorish behavior. In September Brooklyn magazine reported that he spent the Friday before the government shutdown boozing at a Bay Ridge bar where he got attention for getting handsy with his female companion before the two disappeared into a bathroom stall for an extended period. ”I was surprised someone so sleazy could be a congressman,” one witness told the magazine. He needs to have his uttBay kicked. Bully. Punk. Grimm is a former undercover FBI agent…and a lawyer…and an ex-marine. 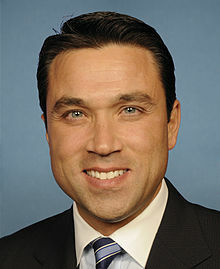 US Rep. Michael Grimm (R., Staten Island) is a lowbrow troglodyte and a disgrace to the people he claims to be representing in NY’s 11th congressional district. “Mr. Hardt, in a posting on NY1’s website, wrote that this was not the first time Mr. Grimm had gotten into a heated confrontation with a reporter for the station. “Following an interview with NY1’s Errol Louis in December of 2012, the congressman blew his top – off-camera,” Mr. Hardt wrote. All Grimm had to do was walk away and the reporter would have looked like a jerk. If he behaves like this in public with cameras all around, it’s frightening to think about how he behaves in private. Professor Turley summed up exactly how the SOTU addresses have become. Circus acts are more honest. Representative Grimm’s future, if allowed to remain unchecked. My count may be off by one or two, but as I recall, the 2013 SOTU address included about 40 or 41 proposals to make things better for the country. I did not agree with all of them, but did agree with many. if not most. Two passed. Congress passed the Violence Against Women Act, and did not default on the national debt, although the latter was up for grabs for a time. Sure hope we see the “Grimm Reaper” come for this “man” reeeeeeal soon.